Rate this Article Virtual Reality has only recently gained widespread use and some VR companies have started to market to parents of young children, but are VR headsets really safe for children? Let’s find out. The widespread use of VR today has brought up several concerns regarding safety and the after effects that may or may not affect a user exposed to the technology for an extended period. With the onslaught of VR devices and gadgets proliferating in the market today, the concern of whether the manufacturers of said devices follow or implement safety procedures with regards to using the devices they sell which usually consist of the VR headset and the peripherals that come with it. As there is already much concern with adults using VR or getting into Virtual Reality, the reality that a child would definitely want to explore and use this new technology cannot be overlooked. Children are inquisitive and would like to try everything or with the very young touch anything, the reason why they almost cannot be left without supervision. As to whether children can use VR devices and explore Virtual Reality as well has become the object of extensive clinical studies done by doctors and neuro-scientists as well as professionals specializing in child psychology. One of the first concerns is the physical safety of the VR headsets and included optical technology and any ill-effects that can harm a child’s eyes. The concern that a child may develop nearsightedness or myopia by staring at something close to the eyes for extended periods of time like reading too much or over watching TV and playing video games was raised due to the distance of the lenses in a VR headset to the eyes which is around 2 inches or a little bit more. However, the optical technology in current VR headsets in combination with the VR software gives the perception of objects being near and far away just like in the real world. The VR simulates distance and depth and your eyes will see them as so. Let’s say a chair in the VR world is around 5ft away from you, you will perceive it as 5ft away from you and your eyes will focus accordingly. Based on personal experience with the Vive, even with high myopia with blurred vision for far away objects, this author was able to perceive clearly far away objects in VR without wearing glasses with the headset. On a positive note, VR headsets can be used to simulate equipment to treat eye vision problems. There is great potential for the development of VR applications that can diagnose eye problems and treat them. Findings show that the effects of the headset lenses would be the same for both children and adults. Another concern would be the physical injury a child can obtain by walking into objects or walls in the real world. An adult wearing a headset and cut-off from his physical surroundings may end up bumping into the things around him with minor bumps and scratches, but a child’s fragile little body may not be sturdy enough to take the same kind of punishment. The best safeguard would be the constant and careful supervision of a child wearing a VR headset. This is a very valid concern and safety must be taken into account when using VR as it applies again to both children and adults. VR is not for everyone, especially when the virtual environment contains a lot of movement like a speeding rollercoaster or even action based FPS games. If a child is likely to vomit while riding or after riding a rollercoaster, chances are the same thing will happen in Virtual reality. The same thing goes for an adult who suffers from motion sickness, virtually induced motion sickness is almost just like the real thing. Few people can remember to close their eyes when wearing a VR headset and if adults can’t remember that, what more with children. Finally the biggest concern with the use of VR with children would be the psychological effect on them. Children are not yet emotionally equipped to withstand strong emotions and VR events simulated as they may be, that can even leave an adult devastated and shaking after a very brief experience. Studies show that children react positively the most to educational VR applications. In short, they love it. VR as an educational tool is already currently being used to educate kids as young as 7 or 8 in controlled supervised environments and the results are very promising. In fact, VR headsets designed for education and positive entertainment for kids are currently available in the market right now. The most popular is the modernized high tech version of the old ViewMaster toy which rose to popularity in the 1960’s and onward that even this author had one as a kid. 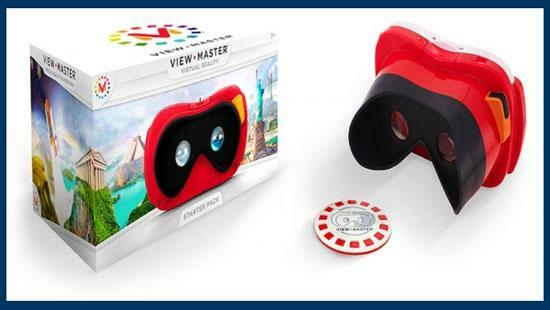 Today, the ViewMaster VR which is being manufactured still by Mattel, uses a smart phone with a specific app inserted into a specially designed VR headset for kids. There are no straps as the child need to hold it to his or her face. The sound also comes from a built-in speaker vent for the phone instead of using a headphone jack or port. An adult may not understand why the headset is designed this way as common headsets have straps to hold it in place and ports for headphones and such, for optimal immersive experience. A child left alone with a VR headset should never be fully cut-off from sensing the real world. ViewMaster VR was designed specifically with child safety in mind. Also if you’re old enough to remember those circular cardboard filmstrips that are inserted into the ViewMaster, today they’re called adventure disks and serve as fiduciary markers for the child-friendly VR and AR applications developed for the ViewMaster VR. Virtual Reality presents as much danger to children as well as adults if not used in the proper and correct way. You wouldn’t let your child play VR Zombie Mayhem or other horrifying games or films on the ViewMaster or any other VR headset for that matter and at times even child-friendly VR apps may need parental supervision as it may cause your child to excitedly jump up and down or exert movements that may lead to actual physical damage. Oculus, Gear VR and other headset manufacturers have also taken the cautious approach to implementing danger warnings and strict age limit guidelines with their devices. After all, the headsets were not designed for kids. As the VR and AR market continues to move forward, kid-friendly apps are sure to be developed and headsets designed specifically for them will surely establish a VR/AR market of its own. However, from what we can see, VR doesn’t seem to be very child-friendly now at least although AR looks to be a pretty good platform for kids. Most parents would be concerned – and righteously so – about letting their child play using VR headsets; headsets that are known to cause adults to experience nausea and dizziness, and well, the long-term effects of such devices on a rapidly-growing brain is still unknown. Though, hopefully, with time and advancing technology, children may one day be able to experience VR as VR gains a foothold in the lives of modern people.